The 3d edition of the international project has just taken place in Wroclaw on 20-30 November 2015 and gathered 32 students of architecture, urban planning and design. For design workshops in 2015, which once again were organized by Open Mind Foundation in cooperation with Faculty of Architecture of Wrocław University of Technology, young people came from five European countries: Germany, The Czech Republic, Slovakia, Hungary and Poland among them also students of European Universities coming from as far away as Brazil and Vietnam. Participants of workshops engaged in creative activity, and exchange of knowledge and experiences, with a special focus on creation of functional and aesthetic spatial arrangements for the river areas in Wroclaw. 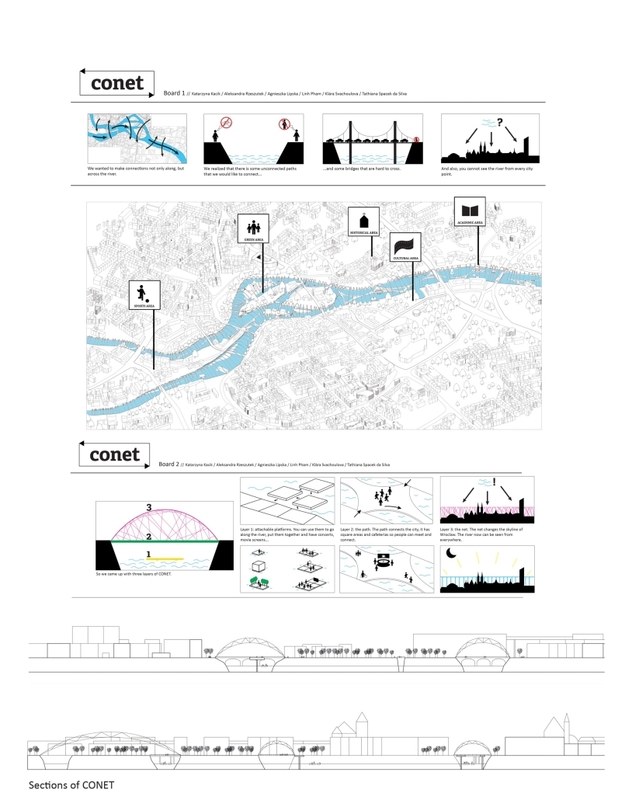 For ten days, in five working groups, students were working under the guidance of designers and architects on one particular aim, creation of concepts of the modernization of selected riverside area in Wroclaw. The role of mentor of the project played by representatives of Faculty of Architecture of Wrocław University of Technology – Dr. Anna Bać and Arch. Piotr Michalski. The starting point for work was the Oder River and the adjacent areas stretching from the mouth of the Olawa River via Xawery Dunikowski Boulevard, Wyspa Piasek, the hydroelectric power station designed by Max Berg up to Sikorski Bridge and a section of University Bridge along the Kurkowa Street. Five different projects were prepared in the forms of graphic boards, mock-ups, presentations and videos under the guidance of tutors, well known and leading architects: Bogusław Wowrzeczka, Roman Rutkowski, Tomasz Głowacki, Mariusz Szlachcic, Edward Lach of the Faculty of Architecture at the Wrocław University of Technology The work could have not been done without the supervision of PhD students from the Faculty of Architecture at the Wrocław University of Technology: Katarzyna Targowska, Lea Kazanecka-Olejnik, Agnieszka Wicińska, Dominika Kopczyk, Agnieszka Wierzbicka and Joanna Kania. The presentation of the workshop results took place on November, 29 in the conference room of the Music Theatre Capitol. Their concepts were evaluated and commented on by: prof. Zbigniew Bać and dr. Anna Bać from the Faculty of Architecture at the Wrocław University of Technology, Michał Duda from Wroclaw Architecture Museum also Andrej Toth from Budapest Metropolitan University of Applied Sciences. Soon after the presentation the public debate “Fluidity of City- river in the structure of agglomeration” took place, during which we summarized the results of workshops and discussed the potential of Oder river in Wroclaw, debate was moderated by Tomasz Bojęć from think-tank BLOKBLOG. 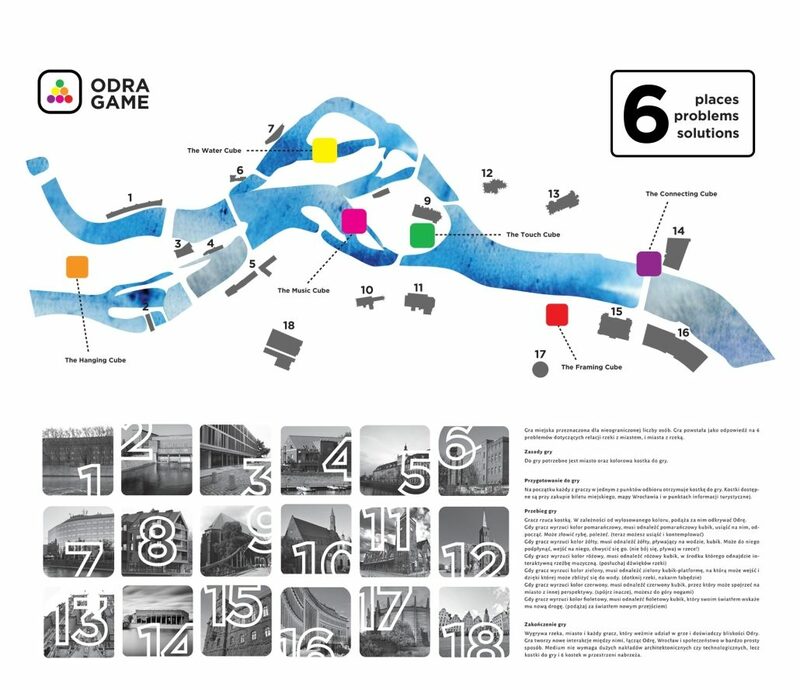 The main idea for the project is to create many connections between the Oder river and Wrocław, therefore they would be permanently linked. This contact can appear along a river, leading not only through Wrocław, but also beyond its borders, to other cities and countries. The connection also needs to emerge perpendicularly to the river, so that everyone can get from one bank to another. Finally, a form of an identification with the Oder should be created, and the river should be visible from further parts of the city, allowing its constant influence on people, functional, visual and mental. The Oder faces many problems, difficulty in crossing bridges, lack of connections between paths on river banks, insufficiency in river-related entertainments and inability to locate the water. 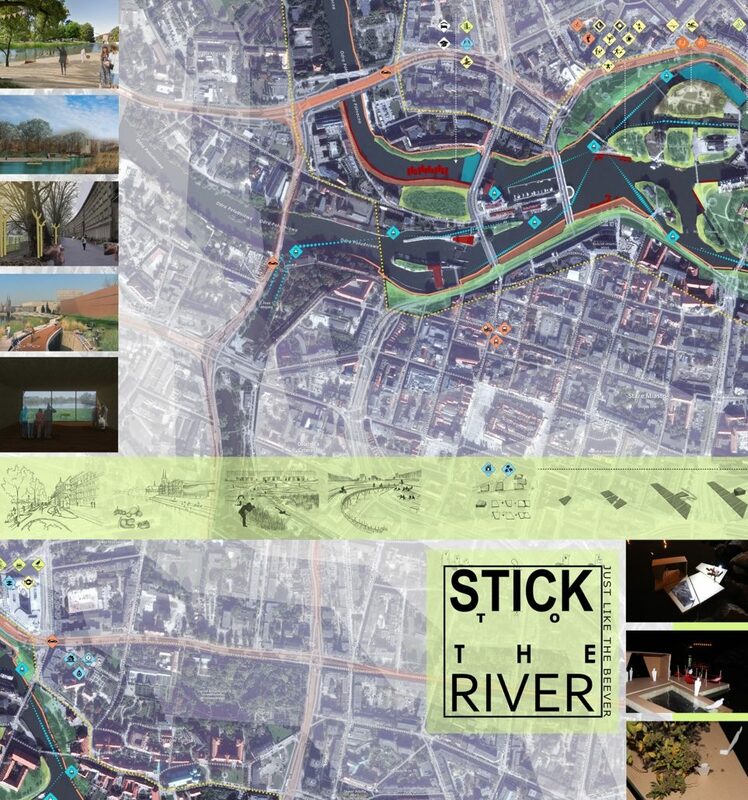 The project proposes solving those problems by enhancement of bonds with the river. In the chosen area the connection is carried out on three levels. The first one is on the height of the water, where floating platforms are placed. They allow users to travel along the river, between banks, marinas or different cities. The pods can be attached to each other, or float individually. They include such facilities as public buildings, houses, gardens, open theatres, stages, individual transportation. Another layer of connection, the path, is on the height of the pavement and defines the movement perpendicular to the Oder. It is treated as public spaces with squares, parks, playgrounds, bars, cycling paths, wide trampolines placed over the water. The last layer is the net, which covers the river. The role of the transparent construction is to create identification with this place, make it dominant and visible throughout the city. With those layers the Oder becomes connected to people living in Wrocław. Representatives of this group created a project to revitalize the banks of the Oder River with the help of bystanders and careful analysis of the Fresh Design project area. Survey which was conducted among residents of the city, along with the analysis of literature and old photographs showed that currently the city turns off the river Oder, for instance prohibiting the 24 hour use of Słodowa Island or banning the “Barbarka” party barge on the river, and that on a larger part of the bank of the river the high fence is built, which makes access to water almost impossible. 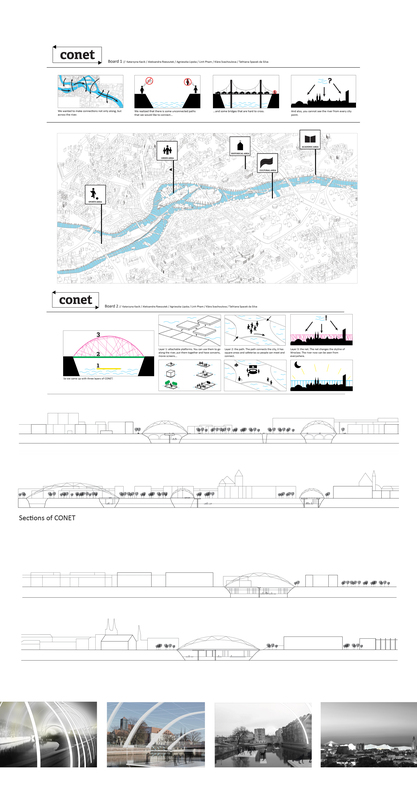 The concept is proposing the construction the path pontoon on the water along the river bank, with additional platforms that can be arranged and connected with each other in any way to get sufficient space, for example for the swimming pool, theater, sauna, etc. The next area which was selected for revitalization is Zwierzyniecki Boulevard and Kępa Mieszczańska. Revitalization of this parts consists of turning the walls for street art projects (murals) and the creation of so-called floating hostel. Another areas of project was Slodowa and Bielarski islands and the water areas around it. Here the group planned to provide water purification, so inhabitants can have safe use of river water swimming in it. Slodowa island is adapted into a green garden, while Bielarski is turned into the public beach in the city center. 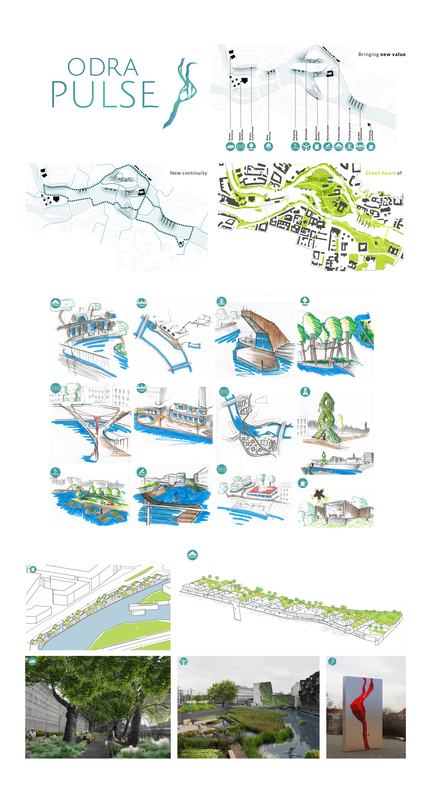 As a result of conducted analyses and walks, students suggested various solutions, which supposed to revive unattractive spaces and the recreational path – which connects whole riverside and enables a free communication for pedestrians and cyclists. Islands on the river resembles a heart and surrounding river banks resemble veins – this was an inspiration for designed sculptures and visual identification of the area. Students suggested naturalization of the river by planting vegetation, grass and bushes. Between Słodowa and Piasek islands an open swimming area would arise. In the Odra canal, surrounded by Bielarska and Słodowa islands a system of swamps and platforms over it which connect both islands has been designed. Also students designed different floating gardens. Project also includes creation of two promenades. Empty, huge areas next to Max Born sq. and Księcia Witolda street is allocated for intense house development with sport resources – for example, basketball field. Whole area would be connected by paths, stretching along the river and new footbridges, this would enable to walk down and access the river. 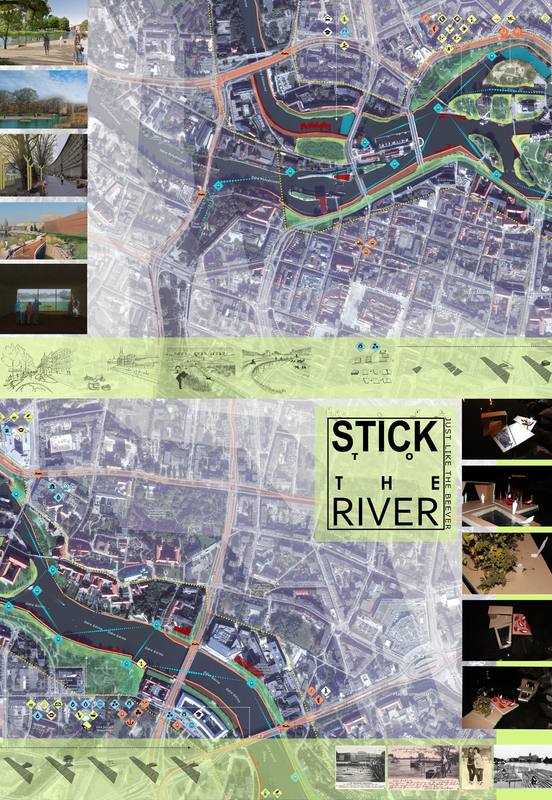 The main idea of the project is to bring the river to the city and the city to the river in a simple, inexpensive, and above all in the way that every inhabitant of Wroclaw can identify through the city game. 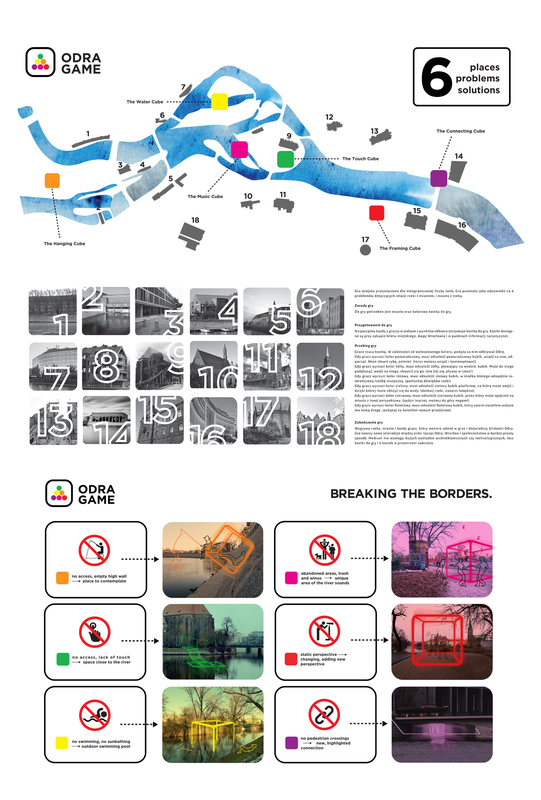 Students invite you to visit 6- places, showing 6 different barriers between the river and the city. 6 different colored cubes represent a simple solution to the addressed issues. 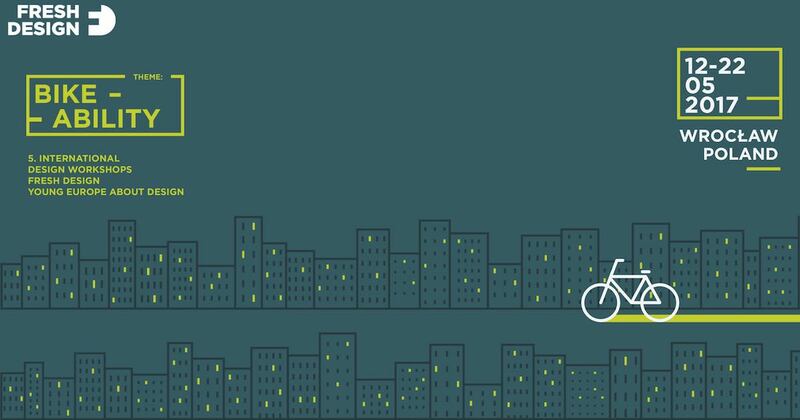 Urban game is designed for an unlimited number of people. Everyone who purchased a public transport ticket will pick up his/her own cube. The winner is river, city and every player who participates in the game and experiencing the connection to Oder river. The game creates new way of interactions, connecting Oder, Wroclaw and community in a very simple way. 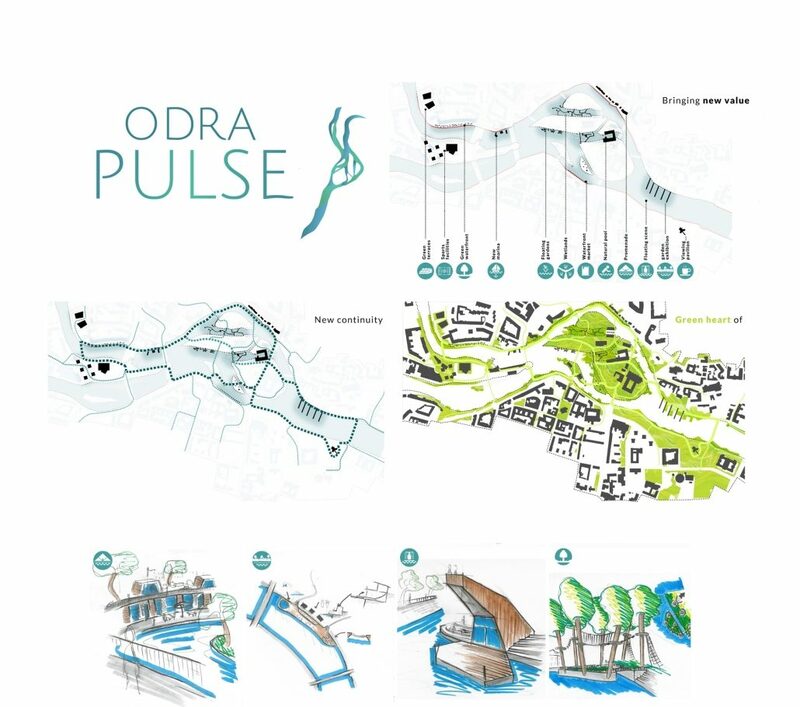 Project of design that will not intervene the existing landscape, but will allow to humanize its artificial elements, which are, for example high concrete walls limiting direct access to the Odra river or lack of quays. The group was inspired with the image of floating chunks of ice. 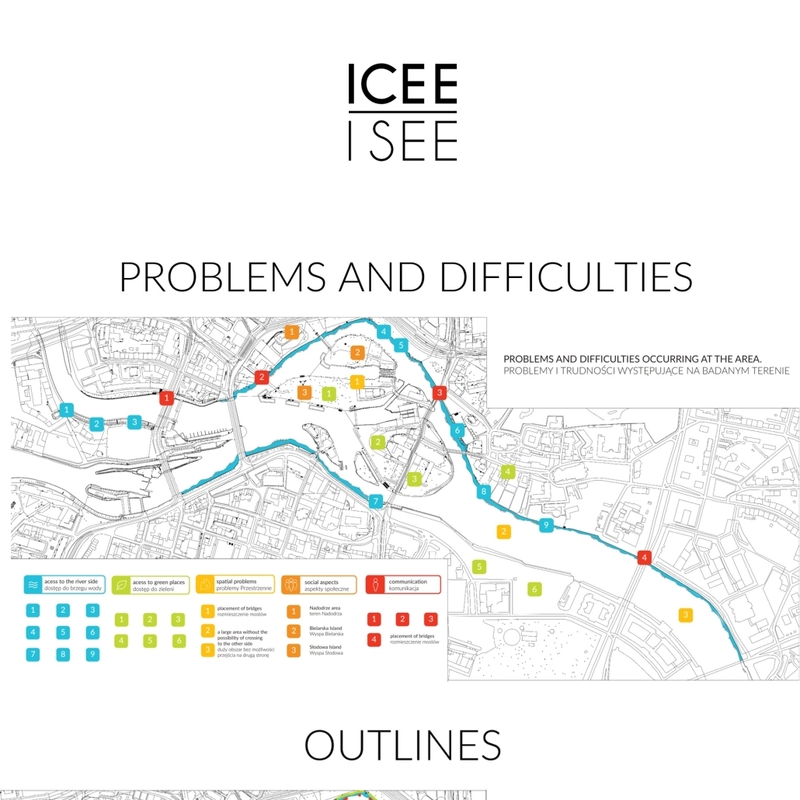 ICEE / ISEE is a floating platform that can be controlled with a mobile application. They are equipped with a folding seats, allowing for comfortable rest on the water. Access to the platform would be free of charge, which would facilitate the exchange between inhabitants of different districts. Platforms will be equipped with electromagnets that allow to combine them into larger areas when needed. Energy usage will be provided with Solar cells, installed on floating green docks which functioning as floating gardens. The docks are also equipped with stations producing algae, which allow to filter air and water pollution. In the area of Słodowa island, the floating pool on the river, with filtered water will be created. Excess energy produced by the docks would be transferred into the city and used for lighting streets and public places.